Shadow Oak Plantation offers well over 3,000 acres of diverse, managed quail habitat made up of typical southwest Georgia tall plantation pines with an understory of broomsedge, lovegrass, partridge peas, and native grasses. Crop field edges and hardwood thickets add diversity for hunters to enjoy a fun and varied experience of traditional Southern wingshooting. Morning and afternoon quail hunts are of approximately three-hour duration. Our experienced and attentive guides and dog handlers know every corner and covey of Shadow Oak and will do everything to put you into an abundance of birds providing great upland shooting. 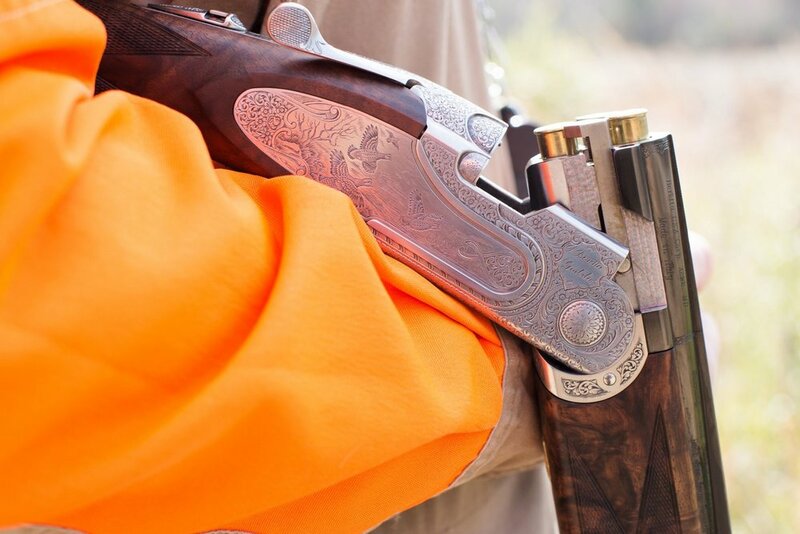 Safety is always first at Shadow Oak assuring all our guests can focus on the hunt and have an enjoyable time. We limit the number of shooters on the ground to two for each time dogs point and birds are flushed. Shooters take turns giving equal opportunities to all shooters. Parties of four hunters per jeep are ideal. Best of all, at Shadow Oak we invite you to shoot your limit with no overkill fees to take your mind off the fun! From our specially equipped hunting rig, you can watch as our masterful bird dogs skillfully use their scenting ability to hunt the coverts and hone in on birds, then slam on point! You feel your adrenalin as your guide helps position you for the best shot. A cocker spaniel rushes by you and suddenly— and it always provides a new thrill — the whir of rocketing wings out ahead. Deliberately, you select your target whilst swinging your gun. Does the cocker make a retrieve? What boasts and lies will be told by the fire at the close of the day? Quail hunting in the Southern tradition! That’s what it’s all about at Shadow Oak Plantation. Exceptional bird dogs and great bird work make a Bobwhite quail hunt. Shadow Oak Plantation owner Butch Houston knows a thing or two about that subject. For over 40 years Butch, himself an avid gunner, has bred bird dogs and campaigned pointers and English setters on the major field trial circuits with top professional handlers. The most famous of his winning dogs is English Setter Champion Shadow Oak Bo. Bo’s prestigious wins include the 2011 Continental Open All-Age Championship held on the famous Dixie Plantation in Greenville, Florida and the 2013 and 2014 National Bird Dog Championship, one of the oldest field trials in the country, first run in 1896 and held each year in early February on the Ames Plantation in Grand Junction, Tennessee. Many Bo sons and daughters are on our string of hunting dogs showing off their great champion sire’s ability to find and point quail. You’ll also hunt over our well-trained Pointers and German Shorthaired Pointers. Birds are flushed primarily by our English Cocker Spaniels and your shot birds are retrieved by our Labrador Retrievers and Cockers. A Southern favorite, nothing is more fun than watching the speed and enthusiasm of a working Cocker Spaniel! Each spring after quail hunting season, our plantation pine forests undergo the traditional quail habitat management tool of prescribed burning. Feed strips of sorghum, millet and milo are planted in early July and come September blocks are mowed to get ready for the coming quail season. Our European Style Tower Pheasant Shoots are a great way to hone your pass shooting skills and have lots of fun shooting with a large group of friends or clients. 8 to 14 gunners (as many as 20 non-overnight shooters) are stationed behind haybale blinds in a large circumference circle around our 16’ tower. Look out for some challenging shooting as the pheasants are flown from the tower. After five birds are flighted individually, the action stops and hunters are rotated in one direction to the next blind. This rotation continues throughout the shoot till all the birds are flown (generally about 150 pheasants total). Each station offers a different perspective of the tower giving the shooter a variety of presentations. Downed birds are picked up by our Labrador Retrievers. The use a modified or full choke and #6 shot is highly recommended. If you have not been to a Tower Pheasant Shoot, you’ll find ours demanding even for the most experienced shot gunner. At the end of the shoot, the downed pheasants are divided equally, cleaned and packaged for you to take home. Costs of our Tower Shoots are reasonable and dependent on the cost of pheasants. Book your Tower Pheasant Shoot. We welcome you to warm up for your quail hunt or pheasant shoot by breaking some clay targets using our Wobble Trap. A variant of standard Trap shooting, Wobble targets follow a more extreme flight path (the Wobble trap oscillates up and down as well as side to side) making it more challenging and more like wingshooting. A hearty, home-cooked breakfast is served in the dining room of the main lodge at 8:00 am. At 8:30, your guide (s) arrives in the specially designed and equipped hunting rig or “Bird Buggy” and will go through a safety talk before you embark on your morning quail hunt. We’ll have you in the field by 9:00; dogs released searching for their first covey. You will hunt with your group of guests of two to six hunters (ideally four to one hunting wagon) with one guide. We do not mix hunting parties in the field. For safety reasons, a maximum of only two shooters can be on the ground at one time and will rotate allowing all gunners to have equal shooting opportunities. A delicious lunch is served back at the lodge at noon, followed by a short relaxation time or a quick round of Wobble Trap before we head back for the afternoon hunt at 1:30 or 2:00. 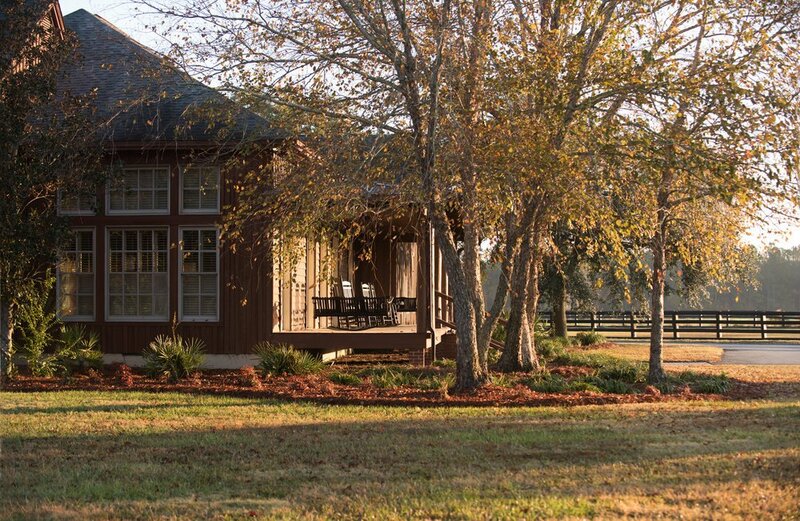 At the end of your afternoon quail hunt, we’ll bring you back to the lodge where you can enjoy the late afternoon rocking on the porch or in front of a warm fire, cocktail in hand awaiting your scrumptious home-cooked Southern dinner, casual style! After dinner, our great room is a wonderful place to relax, read, or watch television. Enjoy the privacy of the screened in back porch or play a game of pool in the Bunkhouse before retiring to your bedroom. You will require typical upland gear including a hunting vest or shell pouch, field shirt, jacket, rain wear, waterproof boots (or a pair of rubber boots for damp mornings and leather boots for afternoons), brier pants or chaps, and shooting glasses. Shotgun and shells. We’ll supply your Shadow Oak blaze orange cap. Dinner is casual at the lodge; no formal attire is required. Shadow Oak Plantation offers their logo-embroidered upland vests and shirts, t-shirts, and shell pouches for sale. For those who prefer not to transport their shotguns, we offer rentals of 20 gauge over and under shotguns at $25/day as well as 12 and 20 gauge shot shells (8 and 6 shot for pheasants). 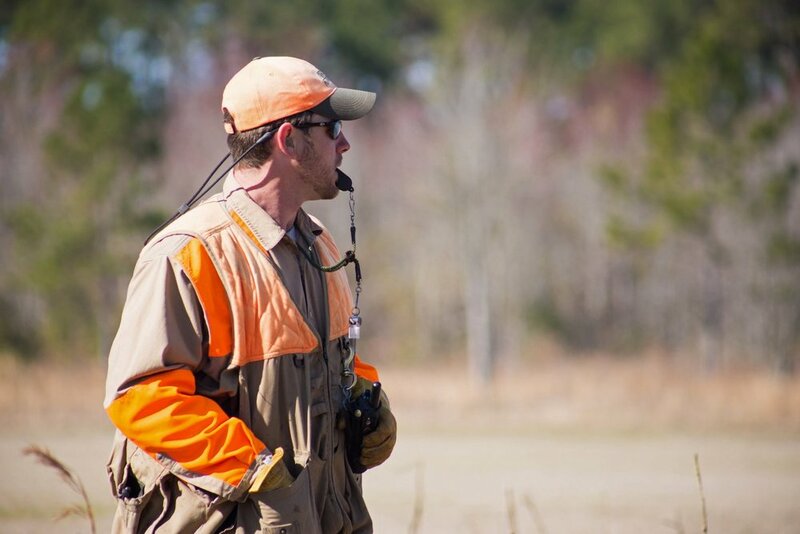 You are required to purchase a GA hunting license available online through the Georgia Dept. of Natural Resources. To save time, we suggest you purchase your hunting license prior to arrival. • For safety reasons, we prefer you use an over-and-under or side-by-side shotgun. • Your gun must be unloaded and the chamber open when you are around the lodge area. If you have a double barrel or over-and-under shotgun, please have them broken open. • Do not load your gun in the field until your guide has indicated you to do so. • While in the field, always keep your safety on until birds are flushed and you are readying to shoot. • Your gun’s safety can fail. Be sure the muzzle is always pointed in a safe direction, away from people and dogs. Always have your muzzle pointed in a safe direction (normally straight up) even if the gun is unloaded. • Alcohol consumption is absolutely not permitted before or during any hunt or while trap shooting. At the end of the day, we welcome you to enjoy our open bar for cocktails. • No one under the age of 12 is permitted to handle a shotgun.12–15 year old hunters must be accompanied by a supervising adult and have completed a Hunter Education Course. Only one young gunner will be permitted on the ground at one time. • Your guide has the authority to end your hunt if he deems it a safety risk for guides, other hunters, or the gundogs.